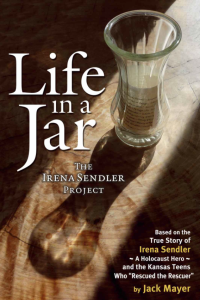 Life in a Jar: The Irena Sendler Project by Jack Mayer is a powerful story of the Holocaust and more. First, it is the story of the extraordinary Irena Sendler, the great rescuer of Warsaw. It is also the inspirational story of students from Kansas, each carrying their own painful burden, each called in their own complex way to the history of a Catholic woman who knocked on Jewish doors in the Warsaw ghetto and, in Sendler’s own words, “tried to talk the mothers out of their children.” Inspired by Irena Sendler, they are living examples of the power of one person to change the world and models for young people everywhere.” The proceeds are used to care for Holocaust rescuers who are still alive. There is a discount available if purchasing the book in bulk amounts. Please email nconard@terraworld.net for more information.